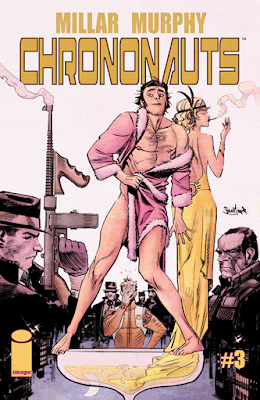 It's hard to describe Chrononauts #3 in one word. 'Bonkers' comes close, but it's such a wild ride you'd need movie comparisons. If you took Smokey and the Bandit, Back to the Future, and Stargate and put it in a blender with a cocaine-laced can of Red Bull you'd come pretty close to the adrenaline rush this issue doles out. Danny and Corbin have been having a great time jumping around the time stream gaining riches and prestige, but it's all starting to catch up to them. They're starting to get sloppy and with Command's troops hot on their trail the boys are in a heap of trouble. Mark Millar has his reckless duo starting to see consequences for their extravagant time traveling. This directly leads to some of Sean Murphy's most challenging work trying to keep up with Millar's off-the-wall storytelling. Luckily, Murphy is more than up to the task. It's almost as if Millar is daring Murphy to draw virtually every era in history as the two time bandits try and outrun Command's forces while speeding along in a sports car. Millar and Murphy are a great tandem and they compliment each other quite nicely, but it's rare to see this kind of synergy in a book. In basketball terms, Millar is the point guard lobbing the alley-loop ball further and higher from the rim fully expecting Murphy to raise up and bring it down in a thunderous dunk. Murphy is the Blake Griffin of comic book artists able to reach back, control the ball and slam it down every damn time. There's nothing Murphy can't do. I'm sure Millar will keep testing him though. Chrononauts #3 is an absolute blast with the kind of energy and visceral experience you can only get from the big screen, but here it is in print. It's no wonder the movie rights to the book were snatched up so quickly. You're going to get your money's worth.